Flocking III explores the mechanisms of the emergent system, in which individual components can be perceived to express themselves as a group. Nature offers many spectacular examples of this type of behaviour, of which perhaps the most beautiful is the flocking of birds in flight. Of all the birds found in this world, the starling flock is considered to be the most impressive in terms of number and reaction time, and so perhaps for this reason it is given the most beautiful of names – a murmuration. Starling murmurations are also the subject of the most scientific research for these very same reasons; flocks can number greater than 100,000 individual birds and their reaction time whilst in flight as little as 0.026 seconds. My work on the Flocking Series was informed by the research of computer scientist Dr. Pavlos Antoniou of the University of Cyprus and mathematical biologists Luke Coburn and Dr. Iain Couzin of CouzinLabs in Princeton University. As source material for Flocking I-II, data derived from bird flocking simulators (or boids) and their x,y and z co-ordinates in space was translated in musical values of pitch, attack frequency and dynamic. The streams of numbers yielded behavioural types that emulated the movements of birds in the air and in places the score itself bore resemblance to flock patterns and the motion of the wing. Flocking III is a new type of score, based on the realisation that humans also display behavioural patterns and can express themselves as a group. In fact we do this every day of our lives, whether walking in a crowd or listening and responding in the language of music. The grammatical structure of music is formed of basic variables, just as a spoken language is self-organised, and these emergent properties can be translated into action through improvisation. This process is actually how we learn to play music in a large group, as was traditionally found in human societies throughout history and continues simultaneously today in many parts of the world. Performance of the piece requires each member of the ensemble to listen and reach to three variables in the music. 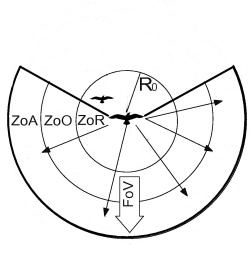 These areas are defined as ZoR, ZoO and ZoA and correspond to the zones of Repulsion, Orientation and Attraction, which are used to translate the motions of flock mechanics into simulations. 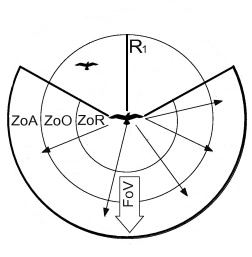 These areas govern the behaviour of the individual bird; when another bird moves into the zone of Repulsion the instinctual response is to move away, and similarly to align or move towards in the zones of Orientation and Attraction. 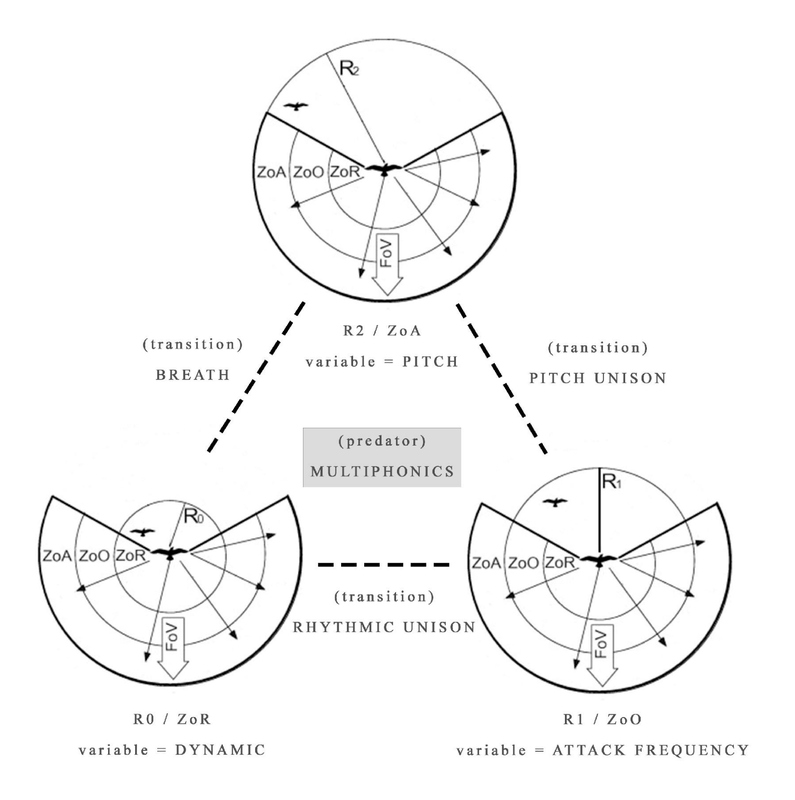 The zone of Attraction (ZoA) takes pitch as its variable. The performer should graduate the pitch or pitches that they are playing according to the sounds that they hear around them, always moving towards the notes that they perceive. The transition to move from ZoA into the next zone occurs when all of the performers play a single unison pitch (or its octaves). 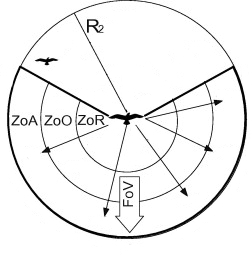 The zone of Orientation (ZoO) takes attack as its variable. The performer should adjust the frequency of attack of the gestures that they are playing according to the frequencies of the rhythmic attacks that they hear around them, always trying to align with these frequencies. The transition to move from ZoO into the next zone occurs when all of the performers play in rhythmic unison (or in metered polyrhythm). The zone of Repulsion (ZoR) takes dynamic as its variable. The performer should emulate the dynamic of the performers around them, but also is encouraged to break the rules of this zone and to improvise freely if they feel so inclined. The transition to move from ZoR into the next zone occurs when all of the performers are playing at a minimum dynamic using breath sounds. The final structural element of the composition is the introduction of the predator to the group flock dynamic. In a large ensemble, one of the performers should be assigned this soloistic role and either do not participate in the performance with the rest of the group, or leave the flock after a certain number of completed cycles. This performer is then freed to periodically interject with varying dynamic gestures using multiphonics solely. Upon hearing the interjections of the predator, the other performers making up the flock should continue to obey the rules of the particular zone in which they find themselves, but also employ solely multiphonic gestures. The spatial positions of the performers and the speed of their responses will govern the behavioural characteristics of the sonic flocking effect. Experimentation is invited with this element of the performance, with relation to both the positioning or mobility of the flock and the predator. The default position of the ensemble is a semi-circle with instruments ordered according to pitch range from stage left to right. Flocking III may begin in any one of the three zones, and the transitional points can lead to either of the two remaining zones. These structural decisions may however be predetermined, in which case the default movement should be ZoA – ZoO – ZoR and continue in a cyclical form. Other predetermined variations may also be developed once the ensemble has performed this initial formal structure. The structure of the work may also, and preferably, by determined in real-time by the improvised responses by the members of the ensemble to the rules for each zone and their transitional movements. It is worth noting that whilst in a particular zone it will prove beneficial to focus primarily on the musical variable that governs this temporal area, even to the extent of limiting the degree of variance in the other two variables employed at other times during the piece.